Every gardener, whether beginner, novice or experienced, can get a little overwhelmed with all the information out there about gardening. There is a lot of advice about everything from amending your soil to growing organically. But if you have never grown garden plants before the easiest way is to just get started and don’t worry too much about everything you read, yet. Select something simple to grow that is suitable to your planting site. Is it sunny or shady? Hot and dry or cool and moist? With just that basic information you can get started. As for the soil, there are a lot of annuals and perennials that will grow in just about any soil. All you have to do is pick a spot, remove any sod or weeds that may be growing, and loosen the soil up a bit so the roots can spread easily. Some of these plants might prefer you mix in at least a little good garden soil, but some won’t mind bad soil at all. And if you don’t want to invest much to get started there are a lot of annuals and perennials that grow very easily from seed, which is substantially cheaper than plants. You won’t need much for garden tools to start, as a matter of fact I still use primarily very basic tools for just about everything. You may need a shovel to remove sod and loosen the soil, if you already have a pitchfork or garden fork that is useful in loosening soil. A hand trowel is just a hand sized shovel to dig small planting holes. And a hand cultivator is just a small garden fork to help loosen surface soil and cultivate weeds out from between plants. You will probably also want a hose sprayer with a fine spray adjustment or a watering can. Now all you need to do is decide if want annuals for all season blooming, an assortment of perennials to bloom at different times throughout the season, or perhaps just some foliage plants. The old fashioned button flowered Bachelor Buttons are very easy to grow in poor dry soil. With long stems these double mini carnation like flowers are great for cutting. The more you cut, the more blooms will be encouraged. Bachelor Buttons do well in average to poor soil but it should be well drained, so heavy clay soil should be avoided. They grow very easily from seed that can be planted just after the last frost in spring. The seed will germinate in about 10 days and grow quickly. Water weekly but do not over water them. A light fertilize every 4 weeks or so will help the plant to grow strong. The stems are typically not sturdy enough for windy conditions, so you might try to plant them in a spot protected from wind. Bachelor Buttons prefer full sun but are quite adaptable to shadier locations. They will also put up with some light frost, so you will get blooms well into fall. Bachelor buttons reseed quite easily, so you will have at least some again next spring. There are a number of newly popular flowers of the Cornflower Bachelor Button family, so be sure to get the old fashioned annual. You may find them called Basket Flower, Blue Bonnet, Cornflower or Boutonniere Flower. Most Gaillardia are perennial, so if you want the easy to grow annual be sure to read the label. Look for Gaillardia pulchella, called Blanket Flower or Indian Blanket. The annual gaillardia are very easy to grow from seed and can tolerate extreme heat and drought. Plant seeds when the soil is good and warm, after the overnight temperatures reach 50 degrees, the seeds may take up to 20 days to germinate. Blanket Flower prefers part to full sun, at least 4 hours of direct sun in midday. Good soil is not necessary, but sandy or at least well drained soil is best so avoid heavy clay. 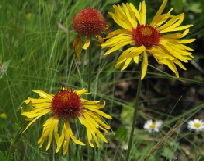 Blanket Flower will reseed quite readily and pop up several new plants the following season. If you want to keep the seeding to a minimum be sure to cut off the flowers as soon as they have faded. Blanket flower is tolerant of light frosts, so it will continue to bloom well into fall. ‘Goblin’, ‘Razzle Dazzle’, ‘Sundance’ and ‘Golden Goblin’ are popular varieties. Often called Spider Flower, Cleome is tall with large clusters of spidery looking flowers. Most Cleome varieties can reach from 3 to even 6 feet tall. Cleome are very easy to grow in nearly any soil and put up with drought very well. They prefer full sun but are also very adaptable to part shade. The more shade Cleome gets, the less profusely it will bloom. The unique blooms are also excellent long lasting cut flowers, adding interesting form to an arrangement. Cleome are quite fragrant, but there is a difference of opinion about whether the musky scent is pleasant or not. Buy your Cleome as young plants, they are not easy to grow from seed. However the open pollinated varieties self seed some, and those seeds germinate quite easily after being “refrigerated” over winter. Purchase a hybrid to avoid self seeding. For a large plant with large flowers that is easy to grow, this is the best. Cosmos are an amazing annual that blooms freely all summer with little or no care. The plant is elegant with airy foliage and delicate looking daisy like flowers floating atop long stems. It is an annual flower but often reseeds, so you will likely see at least a few come up again the following season. And cosmos love bad conditions, they may even grow better if the site is hot and dry. There are several varieties of cosmos that grow from 6 inches to 3 feet tall. And if you want cut flowers, the delicate looking cosmos blooms look great in a vase on their own or as an airy filler for heavier blooms. Cosmos grow very easily from seed. Be careful about selecting a marigold for an easy to grow beginner flower. Many of the new hybrids have specific requirements to grow and bloom well, and are not always disease resistant. Look for Marigold tagetes erecta which are tall and known as American or African marigolds, or Marigold busy t. patula which are more compact and knowns as French Marigolds, or Marigold T. tenuifolia which are small rock garden marigolds that like hot dry conditions. Each of these species has several varieties. All these marigolds like aplenty of sun and will grow in just about any soil if it is well drained. Avoid heavy clay soils which can stay quite wet for long periods. Marigolds grow very easily from seed planted just after the last spring frost. They grow very quickly from seed and may even be blooming in as little as a few weeks. Give marigolds occasional water and do not overwater. And don’t fertilize them at all or you will have lots of foliage with little blooming. Marigolds are long lasting when cut for an arrangement, which will also encourage the plant to produce more blooms. The richly colored flowers and lush foliage of nasturtiums give the appearance of a demanding plant. But Nasturtium are surprisingly easy to grow. Nasturtiums grow very well in poor soil, even very sandy soil. They want lots of sun and water, but should be watered deeply but not frequently. And there is no need at all to fertilize Nasturtium, that will only cause even more lush foliage with fewer flowers. The one problem with Nasturtium is they are a magnet for aphids. This is not necessarily all bad, many gardeners love Nasturtium to act as an aphid trap, keeping them off crop plants. A strong spray from the garden hose will blast them off your plant if you choose. You will not likely find Nasturtium as a bedding plant at the nursery, they are typically grown from seed because they grow so easily and quickly. Not only are nasturtium surprisingly easy to grow, they are edible too. The flowers and young foliage have a peppery taste that is wonderful when added to soup or salad. You just can’t beat petunias for endless blooms, carpets of color and easy to grow with a little bit of maintenance. What petunias want most is lots of sunshine, you need to make sure they get at least six hours of strong sun, all day is even better. Petunias are not fussy about the soil except that it must be well drained. Heavy clay soil tends to stay wet too long for petunias to be happy. And they don’t do as well in humid regions. Petunias do like to be fertilized thought to keep up with a heavy flower production. You can work a balanced granular into the soil when you plant, then feed with a liquid fertilizer every few weeks, more often for the spreading petunias. The spreading varieties will also want regular water, whereas the mounding grandifloras and multifloras will be very tolerant of heat and drought. One thing to keep in mind about the grandiflora petunias, the blooms tend to get mushy and slimy from water or rain. The Multiflora holds up better. Most of the new spreading petunia varieties such as the ‘Wave’, ‘Supertunia’, ‘Cascadia’ and ‘Surfina’ do not require deadheading to encourage continuous blooming, but you may prefer to deadhead to maintain a neat appearance. All varieties of petunias tend to get a bit “long legged” late in the season. If you snip back the stems up to half way about midseason the plant will remain fuller to the end of the season. In theory petunias are somewhat susceptible to a variety of insects and viruses, but in all my years of planting literally a hundred or more petunias every year, I have never seen any such problems. Although petunias are very easy to grow as purchased transplants. they are somewhat difficult to grow from seed. Sunflowers are one of the easiest annual flowers to grow. Sunflowers are tough annuals that will grow in any soil that is not wet for long periods. They are very tolerant of poor soil, but will do better in at least average soil. They love heat and all day sun. There are an amazing number of sunflower varieties. Many of them are the towering sunflowers we all remember, but there are new varieties that are shorter and even dwarf, making it easier to incorporate sunflowers into any garden. Sunflower should be planted by seed, they do not care to be transplanted at all. Seeds can be planted after the last spring frost. If your soil is poor, you can mix a balanced granular fertilizer into the soil before you plant. Water young plants deeply to encourage deep roots, especially with the tall varieties that will need good roots to hold them in windy conditions. It is a good idea to stake the taller sunflowers or plant them in a sheltered spot, along a fence or a wall, to prevent strong winds from toppling them over. Zinnia are tough as nails, growing and blooming like crazy in the worst of conditions. Zinnias need full sun, at least 6 or 8 hours a day, but love sun all day long. Zinnia dont want much for fertilizer, but if you lightly fertilize zinnia every 6 weeks you will keep the plants stronger, and for taller varieties that may help them stand straight and strong in windy conditions. If you cut off the dead flowers more flowering will be encouraged. Since zinnia are great cut flowers, just cutting flowers for vases will also encourage more blooming. Keep the soil moderately moist, but you can let your zinnias get pretty dry before watering, they hold up well through drought and really don’t care for humid or wet conditions. Zinnia can be susceptible to mildew, but most of us plant zinnia in hot dry sites, so it should not be a problem unless you have planted them too close and water too often. Zinnia are almost easiest to grow from seed, they grow very quickly once germinated. Plant seeds when the soil gets good and warm, when overnight temperatures are 50 to 55 degrees. If you buy zinnia plants, look for them in peat pots that can be planted right into the ground to avoid transplant shock. One of the first flowers I ever grew, I seeded zinnia in horrible rock hard soil in full sun along hot black top. The zinnia didn’t mind at all. I watered them every few days until the seedlings got strong and then maybe once a week. But if you soil is better the flower production will be better. Zinnia varieties can be 8 to 30 inches tall with single or double blooms, small or huge flower heads, and a variety of colors. There are many perennials that are easy to grow, but they also have some fairly specific needs and require a fair amount of maintenance. If you are just getting started with gardening or are looking for very low maintenance perennials, these are the best. Black-Eyed Susan is the native daisy of the Rudbeckia species. A favorite of many gardeners, Black-eyed Susan is very showy and very easy to grow. It is a prolific blooming native wildflower that has been popular in backyard gardens for many many years. Typically Black-Eyed Susan is grown from seed since it germinates easily, grows quickly, and usually flowers the first season. Plant seeds even before the last spring frost or even in the fall to germinate the next spring. Black-Eyed Susan is quite happy with average and poor soils as long as it gets full sun. It is very tolerant of heat and drought, but keep young plants watered weekly until well established. Black=Eyed Susan does not need or want fertilizer, that will only create vigorous foliage and diminished blooms. Every few years you will notice that the plants don’t grow quite as vigorously or bloom as much. That means it is time to divide them, which is quite easy to do with this plant. 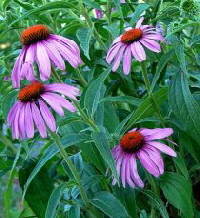 Coneflower, specifically the Purple Coneflower, require very little from you, just well drained soil. Poor soil is actually preferred by Coneflower, if you plant it in rich soil you will have very healthy and vigorous foliage, but not much for flowers. Coneflower will want at least six hours of sun each day, all day sun in northern regions but in warm southern regions Coneflower will prefer some afternoon shade. You won’t even have to water your coneflower other than in periods of drought, and they don’t want any fertilizer. They don’t like it when the roots are wet for more than a short time, so do be sure you have loosened your soil well and avoid planting coneflower in heavy clay unless you are willing to amend your soil. In late summer the plant might look a bit ragged, you can cut the whole plant back by about one third to refresh it. Fresh foliage and additional blooming will be produced quite quickly. Every few years you will notice that the plants don’t grow quite as vigorously or bloom as much. That means it is time to divide them, which is quite easy to do with this plant. Daylilies are likely the easiest perennial to grow, tolerating poor soil, drought and even thriving in roadside beds that are heavily assaulted with road salt and urban pollution. Whether your soil is sandy, clay, good garden soil or quite poor, Daylily is not fussy. Plant them in full sun and don’t worry about watering them unless it has been exceptionally dry. Young plants should get water weekly though until they have become well established. In hot souther regions the blooms may fade out a bit in the heat of summer, so a site with afternoon shade will help your flowers look better. Daylilies will enjoy a light fertilizer in early spring just after they emerge and again in midsummer. Every few years you will notice that the plants don’t grow quite as vigorously or bloom as much. That means it is time to divide them, which is quite easy to do with this plant. There is a very diverse variety of daylily available so you can select different blooming periods and also a great variety of color and bloom size. Stella d’Oro has become a very popular daylily because it blooms repeatedly through summer. Dianthus is a large genus that includes annuals and perennials, so be careful not to just go get some dianthus. The subspecies called “pinks” are the tough and hardy perennials you will be looking for. All the pinks are very adaptable but do want full sun and well drained soil. They are tough and drought tolerant, blooming profusely through most of the growing season. Most dianthus are not very long lived though, so you will need to divide them every few years to produce new fresh plants, however most of them self seed. If you prefer not to have new seedlings, deadhead spent flowers. Dianthus will appreciate a little fertilizer a couple of times a year, some may need some deadheading to encourage continuous blooming, some will tolerate road salt, there are so many dianthus it is hard to cover it all. To keep maintenance to a minimum, evaluate your conditions and then browse the many dianthus varieties to find one that is best suited to your planting site. The Maiden Pink varieties are very easy to grow and care for. Cheddar Pinks are tough, tolerant of heat, humidity and drought, excellent for difficult situations. 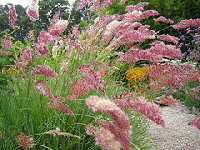 Fringed, Large and Wild Pinks are species plants, very tough and tolerant plants. There are hybrids as well, each of the hybrids will have some advantages and some disadvantages compared. And most will grow easily from seed, especially the Maiden Pinks, dianthus deltoides. Nothing announces spring quite like peonies. They produce an astounding number of huge fragrant blooms. They are extremely cold hardy, deer and rabbits won’t nibble them, and they live for 40 or 50 years. You will have to give them full sun and some rich soil however. Dig in lots of compost and organic matter before you plant and make sure the bud points are only about an inch and a half below the soil surface or they will not do well at all. Plant them in the fall, water them deeply then water weekly until the first frost. Mulch your new peonies the first year. This is the only plant I will encourage you to invest this kind of time for, because then you are done since peony are virtually care free. I think you will agree when those fabulous scented blooms greet you one spring morning. You will have loads and loads of flowers to fill every vase in the house. After spring blooming the plants remain richly green and healthy. Give them a little acid fertilizer after the blooming is finished. Yarrow, or Achillea millefolium, are tough perennials that require very little attention and grow in difficult conditions. Achillea Yarrow thrive in average to even poor soil and just don’t care for rich soil. If the soil is too fertile they grow weak and floppy. They are very tolerant of heat and drought, with a high tolerance for roadsalt. Yarrow are perfect for roadside gardens. Give them full sun and a light fertilizer every several weeks. They bloom for long periods and are wonderful for cutting or drying. ‘Paprika’ is a favorite variety for its spice red blooms but there is a wide range of colors available. Hosta are grown primarily for their interesting foliage and tolerance for heavy shade. Like the peony, hosta is carefree if you have prepared the soil before planting. They do tend to want an organically rich but well drained soil, which means you should dig in some composted manure and organic material such as peat. And not all hosta are created equal. The size will range from minute to huge, bright lemony yellow to deep blue green, and some will do great in dense shade some will even do well in full sun in northern climates. I have found that some varieties do not multiply at all, while others multiply like rabbits. There are over seventy species of hosta with hundreds of cross breeds, so it is difficult to make recommendations for varieties, but if you can get your hands on one of the old fashioned hosta from “grandma’s garden”, known as August Lily or Plantain Lily, they are extremely tough, hardy, adaptable, carefree and do not multiply. If you have friends, family or a neighbor with a well behaved hosta, don’t be shy, ask for a division to plant! Most of us consider it a compliment to be asked. Hen and Chicks are a perennial succulent that is a very easy to grow rock garden or container plant. Hen and Chicks are members of the cactus family, so they thrive in poor sandy or rocky soil. They are pretty adaptable and will do well under a range of conditions as long as they get direct sun for at least six hours, not too much water and excellent drainage from rocky, gravely or sandy soil. They like cool nights and a cold dormant winter up to zone 4. And the hen loves to produce more chicks! So give your plant some room to expand. These are easy bright little plants to grow. There is a vast variety of ornamental grasses that have become more popular in recent years, both annuals and perennials. Many of them thrive with poor soil and neglect. But some are also spread aggressively and are difficult to control. Evaluate the conditions carefully where you want to plant to select the easiest ornamental grass for the site. Feather Reed grass will tolerate the moist heavy soils like clay, but will tolerte other soils. Japanese Blood Grass is striking red tipped perennial grass that only needs a well drained soil and little else. Some varieties spread aggressively, ‘Rubra’ and ‘Red Baron’ are better controlled. June Grass is tough and hardy, putting up with dry soil. It is well behaved with a tight growth habit. Annual ornamental grasses generally self seed, so they are great for containers to prevent spreading. Find an easy plant to grow that you love and give it a try! If you prefer to start with flowers that are bit more particular about good soil, start with a container garden. Just fill a patio pot with ready mixed potting soil (do NOT use garden soil) and you can easily grow beautiful flowers that require good organic soil. You can grow perennials in a container too but they may not survive a harsh winter in cold regions.